VANCOUVER — Area residents are invited to join Clark Public Utilities’ StreamTeam for its largest volunteer event of the year. The annual Earth Day Celebration in partnership with Clark County Public Works will be held on Sat., April 20. Area residents are invited to join Clark Public Utilities’ StreamTeam for its largest volunteer event of the year. 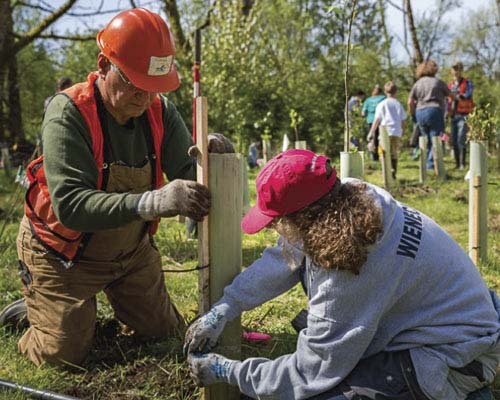 Between 8:30 a.m. and 12:30 p.m., hundreds of volunteers will help StreamTeam leaders plant native trees that improve water quality and keep water temperatures safe for salmon. Volunteers can also sign up to pull invasive garlic mustard alongside Girl Scout Troop 45703 or pick up trash with the Salmon Creek Watershed Council. Advance registration is required to participate in the volunteer activities and space is limited so sign up early. All training and supplies will be provided. Volunteers who work for four hours will receive lunch and a free event t-shirt. The day’s activities also include a free, family-friendly Earth Day Fest from 10 a.m. until 2 p.m. The fair features hands-on games, raffle prizes, OMSI activities, announcement of the annual Watershed Reflections art contest winners, interactive storytelling and hands on demonstrations of amphibians and reptiles. Registration is not required to attend the Fest and all are welcome. Parking is limited and eventgoers are encouraged to park for free at Chuck’s Produce & Market, 2302 NE 117th St. and hop on the free shuttle provided by C-TRAN. For more information, contact Ashley King at StreamTeam@clarkpud.com or (360) 992-8585. This event is made possible through the efforts of Clark Public Utilities, in partnership with Clark County, and thanks to the support of community sponsors such as TwinStar Credit Union, C-TRAN, Chuck’s Produce, Renewal by Anderson, Sunbridge Solar, and Yoder Chiropractic. The StreamTeam is a volunteer-driven program of Clark Public Utilities comprised of more than 1,000 team members who donate more than 3,500 hours of their time each year to save salmon. StreamTeam members come from a myriad of backgrounds including utility employees, Stream Stewards, scout groups, college students, youth groups and active retirees. Activities include tree planting, water quality and plant survival monitoring, and educational outreach. More information is available at www.StreamTeam.net. We'd love to hear your comments! Get a daily email of all new posts.